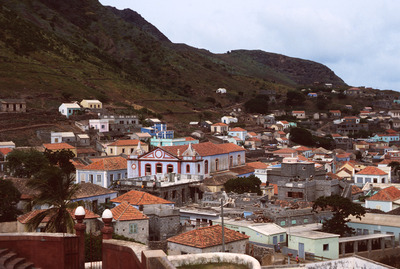 Villa da Ribeira Brava is a town of colorful buildings in an interior valley of São Nicolau. It is the main city on the island. The village gets its name from a river that runs through the valley. In 2010 the village was upgraded to city status, but since the 17th century is has served as the center nof business and trade on Sao Nicolau. Here you can see construction or restoration of buidings.